72 Pages. 49 Plates. Design by Common Name. Interview with Ashley Kistler. Essay by Will Steacy. Over the past four years, American photographer Brian Ulrich has collected found images and objects that offer an idiosyncratic history of postwar consumerism. Featured in this volume are images printed by Ulrich from long-buried newspaper negatives documenting the "Great Prosperity" of the 1940s and 50s that he acquired from private collectors on eBay. He explains: "Almost all of the pictures were taken with a Speed Graphic press camera equipped with flash bulbs, which produces a very specific and, in my opinion, wonderful photographic language that goes well beyond our understanding of Weegee’s street photographs, for instance." An extensive cache of salvaged Polaroids depicting shoplifters evokes one consequence of the "Great Regression" of the 1980s and 90s, reinforcing just how successfully the previous era manufactured and exalted desire as the indelible core of a consumer culture. Objects such as neon signage, department store door pulls, architectural plans and an array of other documents extend this captivating narrative. 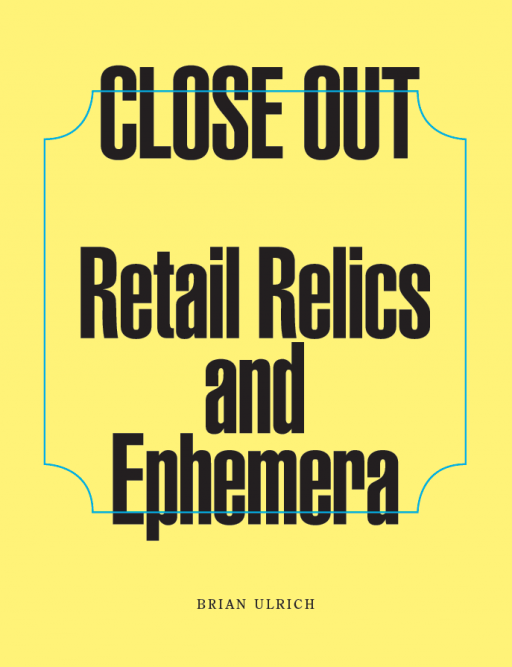 Close Out - Retail Relics and Ephemera accompanied an exhibition at the Anderson Gallery at Virginia Commonwealth University.